(Nanowerk News) Developing more sensitive methods of biomedical imaging that are effective with minimal amounts of contrast agents is an important challenge in the early and accurate diagnosis of illnesses. A new class of materials that appear promising in this quest were introduced in 2006 by Prof. Wenbin Lin of the University of North Carolina at Chapel Hill. Ever since, this emerging area has been growing rapidly as new materials with improved properties are discovered. Wenbin Lin and Joseph Della Rocca present the progress in this field in the Microreview published in the European Journal of Inorganic Chemistry ("Nanoscale Metal-Organic Frameworks: Magnetic Resonance Imaging Contrast Agents and Beyond"). Magnetic resonance imaging (MRI) is a noninvasive technique based on the detection of nuclear spin reorientations in a magnetic field, which, however, is relatively insensitive and typically relies on large doses of administered contrast agents to distinguish adequately between normal and diseased tissues. 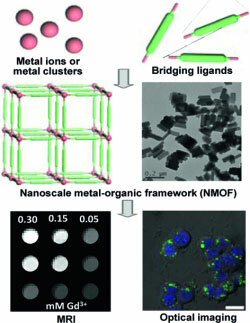 Nanoscale Metal-Organic Frameworks (NMOFs) are combinations of metals and organic molecules on the nanoscale that provide unlimited possibilities for designing task-specific molecules. They are intrinsically biodegradable, and their high porosity makes them ideal for targeted delivery of entrapped agents. They can be specifically targeted to certain regions of the body. In addition to a wealth of applications in other fields, these properties make NMOFs also very suitable for use in biological systems and in particular as more effective contrast agents at lower doses. In addition to Gd carboxylate materials, NMOFs based on Fe, Mn, and Zn were investigated. Coatings such as amorphous silica, biocompatible polymers, and polyoxometalate-peptide hybrid spheres were used to enhance the stability, dispersibility, and biocompatibility of NMOFs. Furthermore, some systems doped with lanthanides were studied as potential multimodal contrast agents. The in vivo and in vitro effectiveness of these agents has been demonstrated. For example, iron carboxylate NMOFs modified with biocompatible polymers were used for imaging the liver and spleen of Wistar rats. Silica-coated, peptide-targeted Mn NMOFs were shown to be selectively taken up by a human colon cancer cell line in vitro. Finally, a versatile iron carboxylate system post-synthetically modified to contain a fluorophore or a chemotherapeutic showed strong fluorescence upon release from the framework and exhibited cytotoxicity comparable to cisplatin against colon cancer cells.